Tag Heuer’s Formula 1 line of watches are a collection of casual sports watches inspired by Formula 1 racing. According to the manufacturer, their “advanced technology is inspired by the extreme performance of the McLaren Formula 1 Team” and their watches are worn by champion drivers Lewis Hamilton and Jenson Button. With the Tag Heuer Formula 1 CAH1212.BA0862 men’s watch, you can join the ranks of these racing greats by embracing the quality and unparalleled style of Tag Heuer. 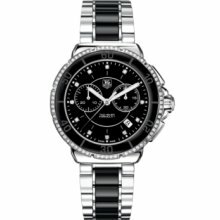 The Tag Heuer Formula 1 CAH1212.BA0862 is a refined, glamorous men’s watch, featuring a black bezel studded with white diamonds, and diamond markers around a dark black face. The contrasting visuals make this watch absolutely sparkle. The luminous silver hands only add to this glowing effect, making this timepiece even more eye-catching. I’m not a huge fan of two-toned bracelets on men’s watches. However, if you happen to like this style, I think you will find that the black band down the center of the bracelet complements the black dial nicely. I am also of the opinion that high-end watches like this one should be simpler, with a less busy face, so I don’t personally care for the extra dials. But again, if you disagree with me, this won’t be a problem for you. If you want a high-quality watch with a sportier look, but still want to flash some bling on your wrist, the Tag Heuer Formula 1 CAH1212.BA0862 is definitely the watch for you.